The Pauline McLeod Primary School Art Exhibition features inspiring and thoughtful art from a wide range of Sydney primary schools. Randwick Council is delighted to host the annual Pauline McLeod Primary School Art Competition at La Perouse Museum, from 20 July to 2 August 2018. 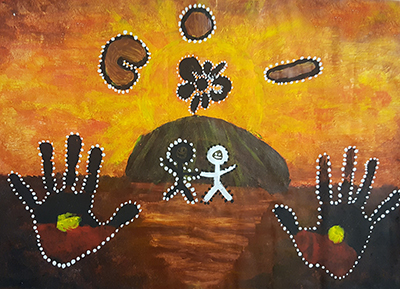 A National Reconciliation Week competition, this exhibition features inspiring and thoughtful art from a wide range of Sydney primary schools. Students explored the theme of “Our Living Cultures”. Pauline Elizabeth McLeod was a proud Yatemetung-Ngarrindjeri woman and member of the Stolen Generations. Through her incredible work as a cultural educator, Pauline McLeod led and inspired Aboriginal and Torres Strait Islander peoples and non-Indigenous Australians towards better understanding, acceptance and healing. The Pauline McLeod Reconciliation Week Primary Schools Art Competition honours her legacy and is a significant Aboriginal and Torres Strait Islander event recognising major work towards Reconciliation. La Perouse Museum is situated on the La Perouse Headland; home to a vibrant Aboriginal community who have had an ongoing connection with this region for many generations that pre-dates Cook’s arrival, and continues to the present day. The Museum will host this exhibition for two weeks as part of its touring schedule.